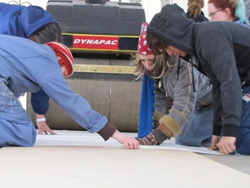 The printmaking program in the College of Visual and Performing Arts (VPA) will present its sixth annual “Steamroller Printing” event on Friday, April 19, at 10 a.m. in a tent on the Quad in front of the Dorothea Ilgen Shaffer Art Building. The event, which will continue throughout the day, is free and open to the public. Students and faculty in the printmaking program will print impressions of large-scale, hand-carved woodblocks using an industrial steamroller. They will sling ink and make finely rolled editions of relief prints. The printmaking program is located in VPA’s Department of Art and includes courses in relief, intaglio, lithography, silkscreen, letterpress printing, hand papermaking and book arts. The program offers both bachelor and master of fine arts degrees; the graduate program was ranked No. 19 in the nation by U.S. News & World Report as part of its 2013 specialty rankings for Best Graduate Schools in Fine Arts. For more information, contact Dusty Herbig, assistant professor of printmaking, at dtherbig@syr.edu.